← LeBron Became a Laker: Does That Free Agency Strategy Help the Nets? Dinwiddie Extension: What does it mean? The Nets and Spencer Dinwiddie have agreed to a three year, $34.3 million extension, with year 3 (2021-2022) being a player option. Per @KeithSmithNBA (applying standard 8% raises), Dinwiddie will make $10,605,600; $11,454,048; and $12,302,496 over the life of the contract. This is a major transaction and will possibly constitute the biggest Nets news of the season, until the NBA Draft. For starters, this is a good deal for Dinwiddie, and for the Nets. For Dinwiddie, yes, he could have made more money if he waited for July 1, to cash in as a UFA. But that carried the risk of a catastrophic injury destroying his value. By signing an extension, he mitigates that risk with the certainty of guaranteed money right now (to be paid later). In addition, in signing a three year deal, with year three being a player option, he used his leverage of being an impending UFA to garner a strong mix of security, in the form of three guaranteed years, and flexibility to get a second big contract, in the form of an opt out after year two, as a 28 year old. Does he cash in as effectively at 30, if he took a four year deal? Does he risk too much guaranteed cash, on a two year deal without a player option? For the Nets, they sign Dinwiddie at a lower number than he would have commanded on the open market in July. That alone makes this a win. Unless they traded him this season (now, they cannot), they needed to extend him. Not extending him, just to sign him for more money in July, would have been a bad outcome. Letting him walk also would have been a bad outcome. This a good outcome. Dinwiddie has been a good Net. He gets downhill to beat switches and make plays late in games — something we constantly see and Atkinson constantly praises. He can torch opponents when hot, and run the offense competently even when not making his shot. He has been an elite reserve, and can function as a low end starter. Even if he does not get a drop better, he will outperform the value of this contract. Not only will Dinwiddie play well for the Nets under this contract, but he will be a valuable trade chip. The Covington trade for Butler (with Saric) is illustrative. The Celtics keeping Marcus Smart to have a mid size deal of value also is. When teams make large trades, they often need a good player on a mid size contract to move to get the deal done. Quality players on $8-$18 million deals are hard to come by. 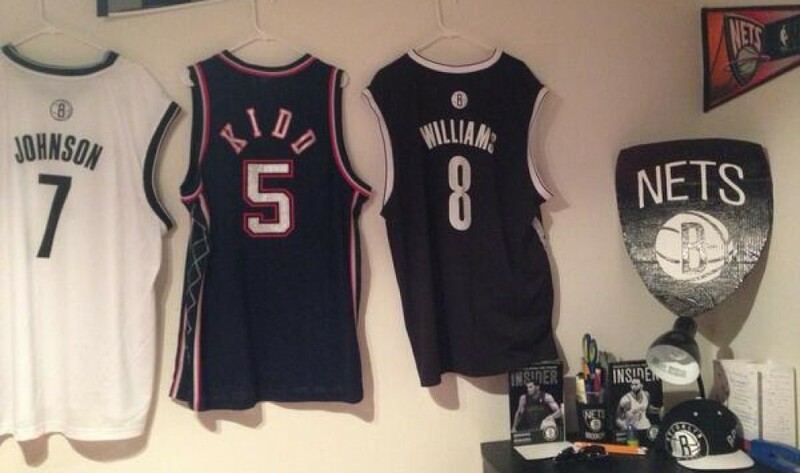 The Nets now have their man. Dinwiddie should hold substantial trade value on this contract. Do the Nets lose a touch over $9 million in cap room next summer? Sure. But what is the risk, given the unlikely nature of a major free agency strike? Plus, the Nets could have nearly $50 million in space, if they renounce all of their free agents — if a great player does want to be a Net, the Nets and the player will make it work. If not, the extra space does not amount to anything. Faced with the risks of Dinwiddie walking, or forcing the Nets in July to pay more than they did today, this was the correct play for the Nets. With all this, one question must be asked: what does this mean for D’Angelo Russell? Both Dinwiddie and Russell have played good basketball this year at times. But neither has shown they are a definitive answer at point guard, a clear top 15 player at the position. On a contract this small, Dinwiddie does not have to be. But Russell, as a RFA, will command significantly more on the market, and will likely get paid like a franchise player or close. The Nets continually lean on Dinwiddie over Russell in fourth quarters, through a combination of benching Russell late in games and running offense through Dinwiddie when both share the floor late in games. Can they really pay Russell like a franchise player when they signed Dinwiddie, and seem legitimately scared to rely on Russell late in games? Is it better to deal Russell for draft picks and assets than to commit to him? After all, if the Nets’ roster next year is essentially this year’s team plus their draft picks, is that really a good result? With the flexibility the Nets have, their sights — whether in the draft or in free agency — should be higher. Sure, the Nets could deal Dinwiddie before the summer; by doing the deal now, they can deal him starting June 13. But while the Nets have that option, it seems unlikely that their PLAN, is to make sure they deal Dinwiddie in a two week window before free agency. They likely expect Dinwiddie to be on the roster next year. Lastly on Russell, his reaction to this will be interesting. Yes, from the objective business perspective, locking Dinwiddie in before he becomes more expensive as a UFA, and not locking Russell in because the RFA process gives the Nets leverage, makes sense. But will Russell see it that way? Or will he see this as, “I didn’t get my deal, and Dinwiddie plays my position, but he got his deal.” That natural, very human reaction, cannot be ruled out. If the Nets do not deal Dinwiddie between June 13-30, they will effectively face the choice of losing Russell for nothing, paying both point guards long term when neither is elite, or getting assets for Russell. The latter may simply be the best choice. Finally, this is a great story, and it feels GOOD. It is super awesome to see a player in Dinwiddie, so close to losing everything, getting perhaps a last chance in Brooklyn, working to beat out the other players at his position, and turning the opportunity into this contract. These types of stories make sports fun. Still, let’s not lose site of the fact that the NBA is a business, and this was a business transaction, not Dinwiddie giving the Nets a hometown discount. The Nets did this deal to avoid paying Dinwiddie more later, and made sure the deal was tradeable. As for Dinwiddie, by making sure he got a player option, he was sure to balance security, as he has three years of guaranteed cash, with leverage, as he can hit the market again at 28 and get another big contract. This was a business transaction on both ends of the table. With a $34.3 million extension in hand, Spencer Dinwiddie figures to be a Brooklyn Net next year. Will D’Angelo Russell join him?